Universal has debuted a poster for Danny Boyle's Steve Jobs film, which is about to premiere and start earning real buzz with critics/journalists. I've heard from numerous places that the film will be premiering at the Telluride Film Festival over Labor Day, and it will also play at the New York Film Festival in October. We've already seen a couple of trailers so far, and it looks way better than I was expecting, though I'm very curious to see how much of an influence Boyle had. Since I'm perhaps more intrigued by Sorkin's script than anything else. Michael Fassbender plays the iconic black-turtleneck-wearing tech innovator Steve Jobs. 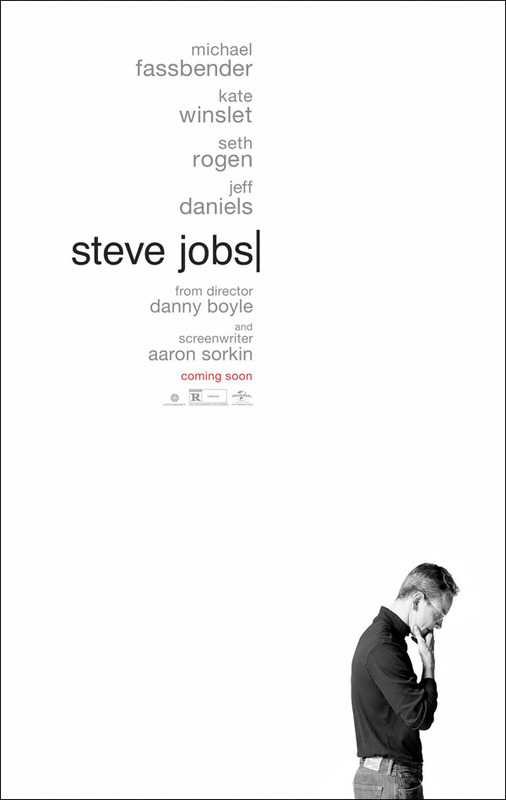 Here's the newest official US poster for Danny Boyle's Steve Jobs film, direct from Universal. Thoughts? You can also still watch the full-length trailer for Danny Boyle's Steve Jobs right here, if you're interested. Steve Jobs is directed by Danny Boyle (Slumdog Millionaire, 127 Hours) and written by Aaron Sorkin (The Social Network, "The West Wing"). Set backstage at three iconic product launches, beginning with the Mac in 1984, moving through the NeXT in 1997 and ending in 1997 with the unveiling of the iPod, the film aims to take audiences behind the scenes of the digital revolution to paint an intimate portrait of the brilliant man at its epicenter, Steve Jobs (Michael Fassbender). The film also stars Seth Rogen, Jeff Daniels, Michael Stuhlbarg, Katherine Waterston and more. Universal will release Steve Jobs starting October 9th this fall. Nice poster. A little busy for Apple. I would have liked to see something like their print ads in the late-1980s and 90s. The ones with the inspirational heady quotes. Looking forward to learning who this Steve Jobs guy is.